Munsters Hearse Musical Sculpture; Scary Stuff. A mischievous cat perched upon mystical books on a chilly evening leaves much to the imagination! Now you can carry such a bewitching scene with you with the Witching Hour Handbag, a custom design exclusively from The Bradford Exchange featuring cat art from acclaimed artist Lisa Parker. Expertly crafted of soft, pebbled faux leather in blocks of red, burgundy and cream with chic belt-style trim, this women's designer-style handbag is perfect for cat lovers! Lisa's artwork is emblazoned on the front of this exceptional cat-themed accessory. A black cat resting atop a book of magic gazes out at you with luminous yellow eyes. A candle flickers nearby, while a dangling golden metallic crescent moon charm is your sign that the witching hour is almost here! The main compartment features a zippered closure for extra security and peace of mind, along with an interior zip pocket and two handy slip pockets. Double faux leather burgundy handles and a 60-inch removable shoulder strap offer you the versatility of a handbag or a cross-body bag. Imported. Strong demand is expected, so order now! Join the most famous citizen of Halloween Town - the Pumpkin King Jack Skellington - and the rest of its weird and wonderful denizens in Tim Burton's The Nightmare Before Christmas Black Light Village Collection - the first-ever village with black light effect from The Bradford Exchange, Hawthorne Village Division. Inspired by the critically-acclaimed movie milestone, your fantastical journey begins with Issue One, Jack Skellington's House, a FREE Jack figurine and the 12" black light fixture. Soon, your collection continues with Issue Two, Dr. Finklestein's Lab and FREE Dr. Finklestein figurine. Additional Halloween Town buildings, each a separate issue and some with FREE figurines and accessories, to follow. These spook-tacular Nightmare Before Christmas collectibles are handcrafted and masterfully hand-painted to capture all of the eerie excitement of Halloween Town. Discover even more ghoulish thrills when you flip on the included 12" black light fixtures and the buildings glow! Strong demand is anticipated, so don't delay. Order now! For a frightfully good time, you don't need to look any further than Halloween Town. Now, join your favorite characters for a few laughs - and screams - in a casual and comfortably classic hoodie. Introducing The Nightmare Before Christmas Men's Hoodie, a first-ever from The Bradford Exchange. This bold custom apparel design is crafted in a black, easy-care cotton blend knit, creating a classic yet cool wardrobe essential. The back of this men's cotton blend hoodie showcases a custom montage with spooky movie artwork of beloved characters against a glowing full moon. Fully embroidered on the front is a portrait of Jack Skellington's face. Custom details include a gray thermal knit-lined hood, kangaroo pockets, knit cuffs and hem, a full front zipper and silver-toned metal tippets on the hood drawstrings. It all adds up to a look so cool, it's scary! Strong demand is expected for this Disney apparel, so don't wait. Order now!This fine apparel is not intended for children. What's this? What's This? It's the Fun With The Nightmare Before Christmas Figurine Collection, a Hamilton Collection special creation starring a quirky quartet of ghoulishly gleeful girls by acclaimed fantasy artist Jasmine Becket-Griffith! Get ready to scare up some spooktacularly sassy and frighteningly fashionable delights, starting with Issue One, Jack. Next to arrive will be Issue Two, Sally. Soon your collection will continue with Issue Three, the Halloween Town Display, followed by Issue Four, Oogie Boogie and Issue Five, Zero, to complete your collection. Each issue will arrive separately. No fan of Tim Burton's The Nightmare Before Christmas can resist the charms of these winged cuties! Inspired by the innovative imagery of the beloved film, Jasmine brings her adorable sprites to boo-tiful life, complete with special friends, Jack, Sally, Oogie Boogie and Zero. Then, each figurine in this collection is uniquely handcrafted in artist's resin by Master Artisans, and hand-painted in shocking detail - no two are exactly alike! 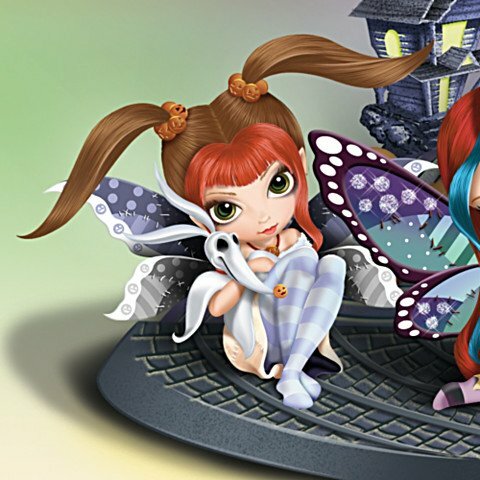 From their signature big bright eyes, colorfully streaked hair and striped stockings, to their spider-web and patchwork-inspired wings, each collectible figurine is frightfully fabulous. Plus, what better way to show them off than the amazing Halloween Town Display, complete with Jack's house, Dr. Finkelstein's Lab, Spiral Hill and even a full harvest moon! Editions are limited to 95 casting days, and strong demand is expected, so don't delay. Order now!Fine collectibles, not intended for children. True love never ends. Now, express your undying devotion with this exclusive limited-edition vampire music box! Eternal romance comes to life in the graceful form of an elegant Vampire Queen seated atop an ornate crypt music box, all inspired by the gothic visions of acclaimed fantasy artist Anne Stokes.Available exclusively from The Bradford Exchange, this fully dimensional gothic music box is handcrafted of fine Heirloom Porcelain. The Vampire Queen is sure to turn heads with her other-worldly features and dramatic gown, while gothic-inspired tattoo designs and touches of 22K gold add more mesmerizing details. The lid of the music box lifts to reveal a secret compartment, and the entire vignette is enhanced by the haunting melody of "Claire de Lune." Strong demand is expected for this spine-chilling gothic vampire treasure, so order now! TV's first family of fright brought ghoulish giggles and a screamingly good time during their spooktacular stint on-air. Now you can display a tribute to their devilishly good fun - and their eerily unforgettable mode of transportation - with the The Munsters Family Koach Sculpture, available exclusively from The Bradford Exchange. Officially licensed and authentically detailed, this sculpture lights up and plays the show's theme song for even more frightful delights! The iconic, hearse-inspired Koach created for the classic TV show is faithfully replicated in three-dimensional detail to create this frightfully realistic musical sculpture that plays the theme song. Finely sculpted and hand-painted, featuring golden lantern headlights, brass-toned carburetors, and chrome-finished pistons, this Koach makes for an eye-catching The Munsters collectible! Herman, Lily, Grandpa and Eddie - in his red rumble seat - are all there, expertly handcrafted to capture their comical personalities. Strong demand is anticipated for this limited-edition tribute, so don't delay. Order now! Raise a toast to anarchy and those who live a life outside the boundaries with the Sons of Anarchy Decanter Set, an officially licensed, limited-edition barware set only from The Bradford Exchange. This boldly designed Sons of Anarchy glass decanter and 4 matching 10-ounce glasses are accented with gleaming 12K gold rims, and the glasses are emblazoned with the Son's cool color palette of black and white with a hint of red. Each tumbler-style glass in this Sons of Anarchy glassware set boasts wrap-around artwork, while the 25-ounce decanter holds court with its metallic Reaper logo and custom glass skull topper. This five-piece set arrives in a distinctive, cushioned, satin-lined gift box - finishing off a noteworthy SAMCRO fan gift for yourself or a special SOA fan. Strong demand is anticipated. Don't delay. Order now! With blood-chilling indifference, the universe delivered the ultimate predator into the world of Ellen Ripley, with each evolutionary stage escalating with ruthlessness and precision with every step. Now, drink in every thrilling moment with the Aliens® Xenomorph Stein, a custom desigin available in a limited edition exclusively from The Bradford Exchange. Capturing the four stages of Xenomorph evolution with breathtaking intensity, your Four Stages of Fear Aliens stein highlights the Xenomorph from egg to face hugger to fully grown warrior to create a terrifying tribute to this classic sci-fi horror. At nearly one foot tall, this drink-safe Aliens stein is handcrafted of Heirloom Porcelain® to feature a wraparound Xenomorph design and is hand-painted in a custom palette adding atmospheric color. Biomechanical design touches pay homage to the H.R. Giger original art, including the custom handle intertwined with the whip-like tail of a warrior. Plus, the zinc alloy lid is topped with a sculptural chest burster, and an Aliens® logo gleams from the brushed metal base of this 40-oz. Aliens collectible stein for the perfect finishing touch. Stellar demand is anticipated, so don't delay. Order now! It is reported that almost half of all alien encounters in the United States are with the "Roswell Greys", a name originating from the famous Roswell, New Mexico, UFO incident that occurred in 1947. Now, these paranormal sightings inspire our Greyson Alien Baby Doll, a first-of-a-kind exclusively from The Ashton-Drake Galleries. Award-winning special effects artist J. Anthony Kosar and Kosart Studios worked diligently sculpting a first-of-its-kind "Baby Grey". He's ultra-realistic enough to win over any non-believer! At 16 inches long, this adorable alien baby doll is fully sculpted with four fingers and three toes on each tiny hand and foot. He is crafted of soft vinyl and coated with a silky smooth finish, then painted by hand. His large black eyes are custom-made to replicate those documented from Roswell. His jointed arms and legs are poseable, and his head pivots to look for intelligent life. He even comes with his own cosmic baby blanket to keep him cozy. This baby alien doll is sure to make you starry-eyed and he makes a unique gift for a fellow believer, but strong demand is anticipated, so don't delay. Order now! The award-winning "Alien™" film excites fans time after time! Now, it is time to prepare yourself and your crew - the Alien® Clock has arrived. A custom design inspired by the 1979 sci-fi horror classic, your Alien illuminated clock is available in a limited edition from The Bradford Exchange and serves as thrilling tribute that's sure to evoke awe from every angle .At nearly one foot tall, this Alien digital clock is meticulously handcrafted and every frighteningly authentic detail is hand-painted, from the terrifying Xenomorph figure poised to attack to the highly-detailed illuminated base and top that capture the derelict spaceship's ominous chambers. Recalling the suspense of the Nostromo's self-destruct mechanism, the digital clock face glows to complete this chilling fan must-have. Stellar demand is anticipated, so don't delay. Order now! A pure killing machine "unclouded by conscience, remorse, or delusions of morality" unleashed on the hapless crew of the Nostromo after answering what they thought was an SOS call from the moon LV-426, that turned out to be a WARNING. Now, bring the doomed ship and the dreaded Xenomorph to Earth with the Alien: Nostromo Masterpiece Sculpture, available only from The Bradford Exchange, Hawthorne Village Division. Impressively sized at one foot long, this officially-licensed Alien spaceship sculpture is sure to bring the horror of this landmark sci-fi film to vividly nightmarish three-dimensional life! This Alien sculpture is handcrafted and hand-painted to highlight its unprecedented detailing from every angle, from the ship itself to the intricate base with official logo. The Xenomorph, a pure killing machine with its whiplash tail, clawed hands and deadly dual jaws, is poised for attack under the doomed ship. Plus, it lights up to cast an eerie green glow on the ship and the deadly creature that lurks below it. This illuminated sculpture is a must-have Alien collectible for fans of the film and makes a stellar Alien fan gift, but strong demand is anticipated, so don't delay. Order now! 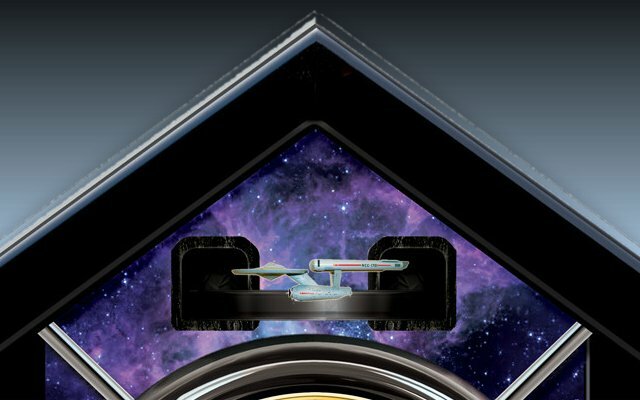 With Captain Kirk in charge, you can beam aboard the Starship Enterprise™ every hour of the day with the first-ever STAR TREK™ Cuckoo Clock, a Bradford Exchange design exclusive in an edition limited to only 5,000 worldwide and officially licensed by CBS Studios Inc.! 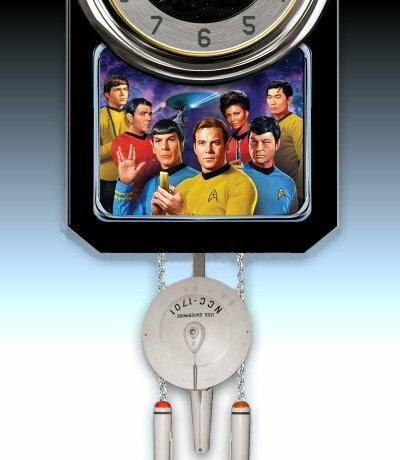 This nearly two feet high stunning tribute wall clock is the perfect way "to boldly go where no one has gone before™"! It even has sound and animation for added adventure. 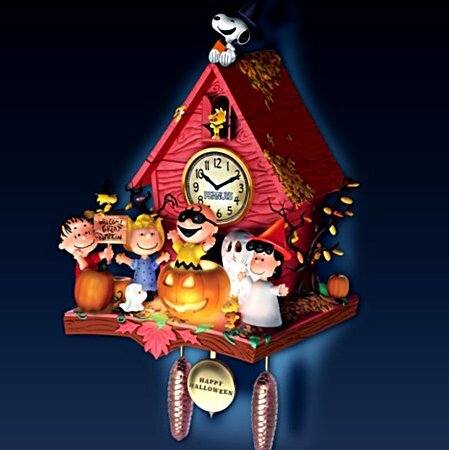 Expertly handcrafted, this wooden cuckoo clock face is protected by glass and adorned by the STAR TREK and Enterprise™ logos. Hand-painted finish and silvery detailing are inspired by the futuristic design of the Enterprise. A striking montage of the Original Series crew, including Mr. Spock and Dr. McCoy, commands attention on the clock body. Plus, every hour brings a new adventure as the Enterprise does a fly-by to the tune of the Original Series theme song. For the perfect finishing touch, the pendulum is designed to look like the Enterprise saucer while the weights resemble the nacelles. Strong demand is expected for this magnificent Starship Enterprise cuckoo clock. Order now!